Here’s an early reaction to Magic Leap One from David Gull, CEO of Outer Realm. The Marina del Ray based company uses VR, AR, and 360° video to showcase real estate and other projects so the Mixed Reality device is a good fit for them. Gull does a seven-minute video response – not a review so much as just his unvarnished thoughts a day after receiving the device. Using the Magic Leap One is way more impressive than looking through a phone, but it feels a lot like using Microsoft’s existing mixed reality headset,the HoloLens, which shipped way back in March of 2016. We noted some of the issues last week – particularly the limited field of view, though the frame around the lenses mitigates that to some degree. It’s definitely better than Microsoft’s HoloLens in the FoV area, but not as much as we were hoping for. (And yes, that’s undoubtedly why they avoided the FoV question in the runup to the release). 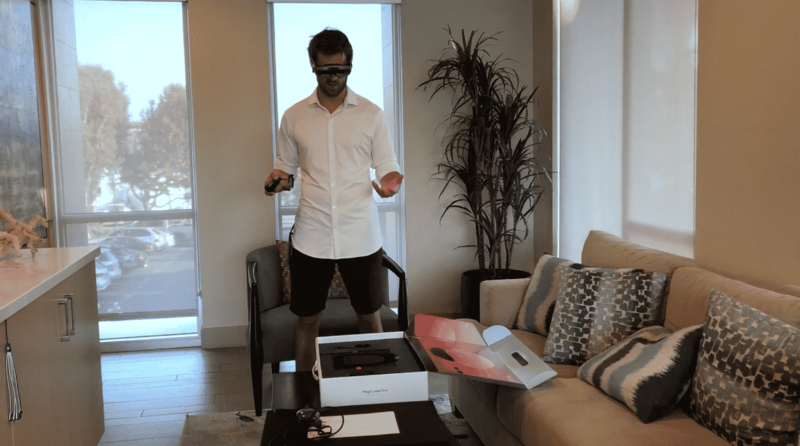 Outer Realm CEO David Gull reacting to the Magic Leap One in his home. Object details are good but bright in a way that keeps them from fitting in with their surroundings. Digital objects sitting firmly on a tabletop. As David Gull notes, many of the issues he raises may be resolved in future versions. And he’s not the only one to point out that while the innovative Mixed Reality headset is far from perfect, it has amazing potential. We’ll keep our eye out for other reviews and feel free to share your initial reaction to Magic Leap One. Despite the issues, it remains in our eyes a potentially ground-breaking Mixed Reality headset. For a wearable device, we’ve come a long way from the early days of Google Glass. 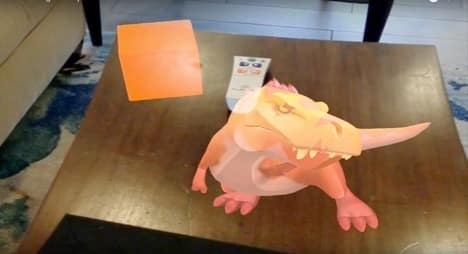 The fitting issue for Magic Leap is a definite challenge for doing public demos and sessions. It’s hard enough now with VR headsets, but for the most part, they fit fairly easily. And yes, only in six cities/areas right now. The white glove set up is a little reminiscent of how Google Glass was rolled out. To me, it’s a concern that you can’t just do it yourself. The fitting aspect is fascinating. You can’t just plug and play it, but need to have your device specifically set up for you as an individual. And only in several cities?